UDM Downloads > Recovery ToolBox for Outlook! 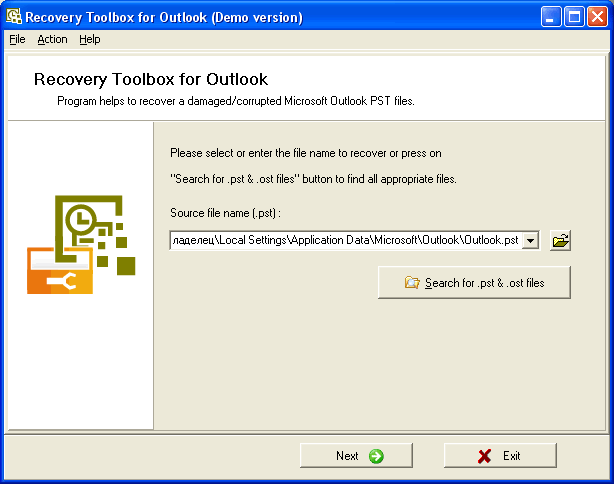 Recovery Toolbox for Outlook repairs ost and pst mailboxes that are used by Microsoft Outlook email client. System administrators know that email represents the most popular way of communication, but, in the same time, it can become the source of various issues. Email is often used to send advertisement or spam and distribute viruses, therefore it often becomes the weakest point of local networks. However, you should not worry because the source data, stored in ost or pst files, can be quickly restored by Recovery Toolbox for Outlook. Our users do not think about the root cause of data corruption issue and they do not understand, why their mailboxes in ost or pst format becomes not accessible. No doubts that you should investigate this problem, but it can be done later or simultaneously with another task at least. We think that you should try to restore the source data, stored in Microsoft Outlook email and it can be done with Recovery Toolbox for Outlook. You cannot find some time for backing up the source data, stored in Microsoft Outlook? Or it cannot be done due to the lack of technical skills? No need to worry, Recovery Toolbox for Outlook is the most efficient way for the recovery of damaged mailboxes, feel free downloading a small executable file to install the service of email recovery, implemented in this program. You should not worry about the size of Recovery Toolbox for Outlook and its system requirements. This program works with all supported applications of Microsoft, including the Windows operating system and Microsoft Outlook. This tool may convert the source data into openable files of pst format that can be accessed by Microsoft Outlook. Moreover, you can keep on using these files instead of damaged mailboxes. However, the utility can also export the source data into separate files of eml, txt and vcf formats. Please find several minutes of your time for the evaluation of Microsoft Outlook recovery solution, it saves a lot of time in future.